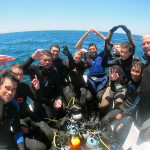 Congratulations to our new open water divers. 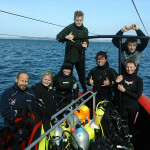 Instructors, Aura and Tim, were on board to complete the final 2 dives of the Open Water course at the Outpost, Leigh. 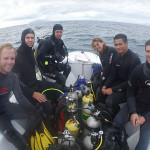 A big thanks to Grant for helping and being my dive buddy for a sneaky dive during the surface interval. 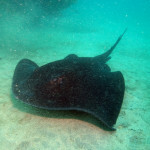 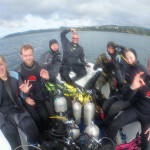 PADI Open Water Course Completed! 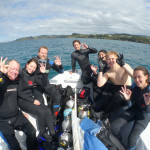 Happy campers on the boat at Mathessons Bay on Sunday. 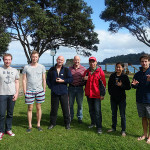 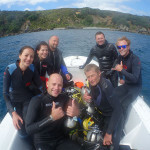 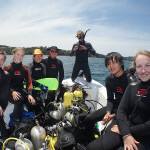 Congratulations to Dale, Nick, Mike, Whiti, Alex, Gavin, Daniel and Carter on completing your PADI Open Water course. 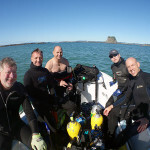 A big thanks to Grant Hanly and Patrick Ruddy for getting them through safely.